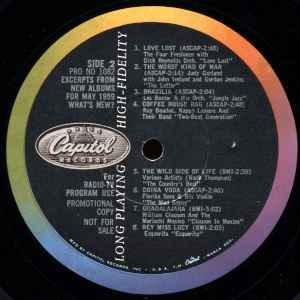 One of a monthly promotional series put out by Capitol Records. Each promotes various Capitol albums that are new for the month. Each side carries its own promo number. The jackets for this series include thumbnails for each album being promoted, plus extensive narrative. The catalog # for each album is also listed. The May, 1959 issue may be most known for track B6 "Hey Miss Lucy" by Esquerita.